Blue Devils able to crack Black Bears' back four. READFIELD — It took one of the most prolific attacking teams in the entire state to finally solve the Maranacook back line. Class A Lewiston scored a pair of second-half goals to break open an intensely defended match against the Class C Black Bears on Tuesday night, as the Blue Devils handed Maranacook its first defeat of the season with a 3-0 decision in a Kennebec Valley Athletic Conference crossover at Ricky Gibson Field of Dreams. 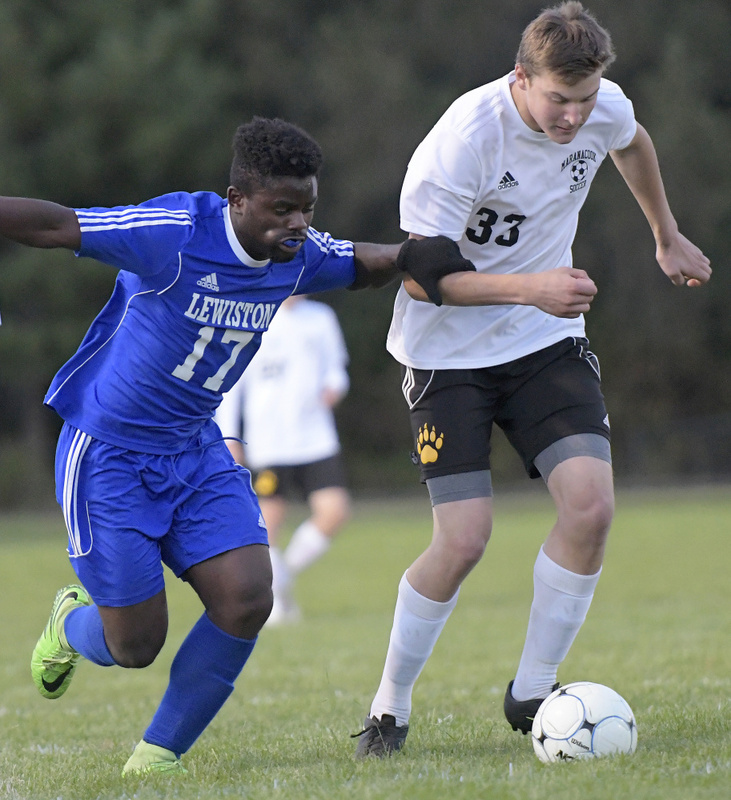 In a game that was closer than the scoreline indicated, Lewiston (8-1-2) gutted the Black Bears with maximized efficiency in the attacking third. Only given enough time and space to produce five shots on frame, the Blue Devils succeeded at a 60 percent clip against Maranacook (10-1-0). “They’re probably the best offensive team that you’re going to see,” Maranacook coach Don Beckwith said. “They’re at a much faster pace, and they’re used to playing at that pace. I’d like to play them four or five times, because I bet we could play with them. We just don’t play at that pace. Ahmed Hussein capped a nice run of possession for the Blue Devils over the final 20 minutes of the opening half, producing the game’s first goal in the 36th minute. Lewiston survived a barrage of Maranacook bids off senior Jackson McPhedran’s midfield service in the 40th minute, with Wyatt Lambert, Mitchell Root and Connor Stockwell all taking cracks at goal in the scrum — only to have each of those attempts blocked by Lewiston defenders, ensuring the game would go to the half with just the one goal. Nine minutes after the break, Lewiston’s Muktar Ali threaded a beautiful ball across the floor for Bilal Hersi, which Hersi collected expertly with a deft touch to the right post that he tapped home himself. Chasing a two-goal deficit, the Black Bears opened themselves up and moved out of a 4-4-2 by adding a third attacking player. Just past the hour mark, Noralddin Othman drilled a 35-yard free kick into the far corner for the 3-0 Blue Devil lead. Ironically, Othman’s goal came on just the type of restart the Black Bears had hoped to capitalize on. 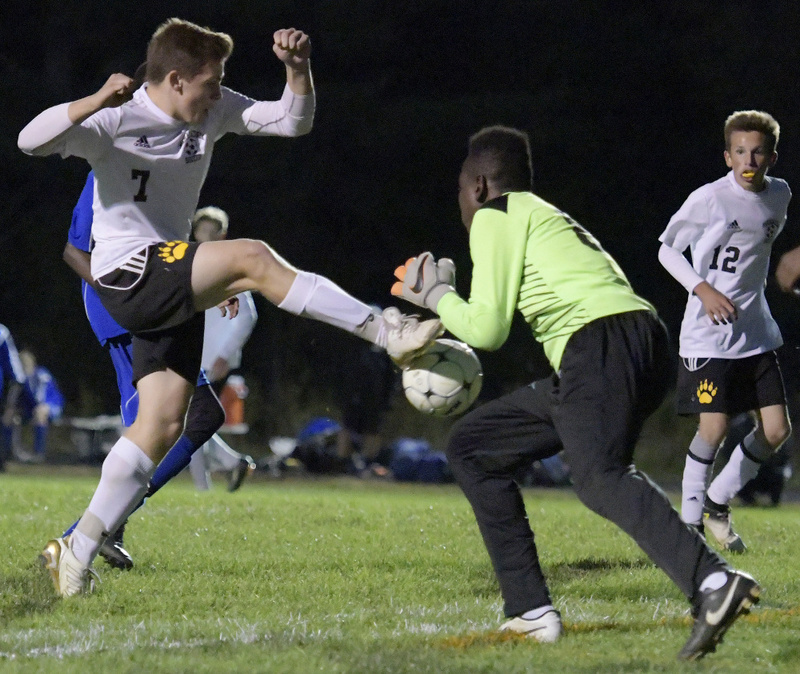 Maranacook entered the night having posted shutouts in eight straight games, surrendering only one goal in its previous 10 games this season, including eight straight shutouts. Lewiston, by contrast, had scored 38 goals in its 10 contests prior. Lewiston coach Mike McGraw expected Maranacook’s back four to be difficult to penetrate directly, asking the Blue Devils to expand the field horizontally. “We tried to play the ball outside a little more so that we could have more space to work,” McGraw said. “You can’t go down the middle against Maranacook because they’re just too tough. They’re big and they’re physical, and they’re not going to let you get anything inside. 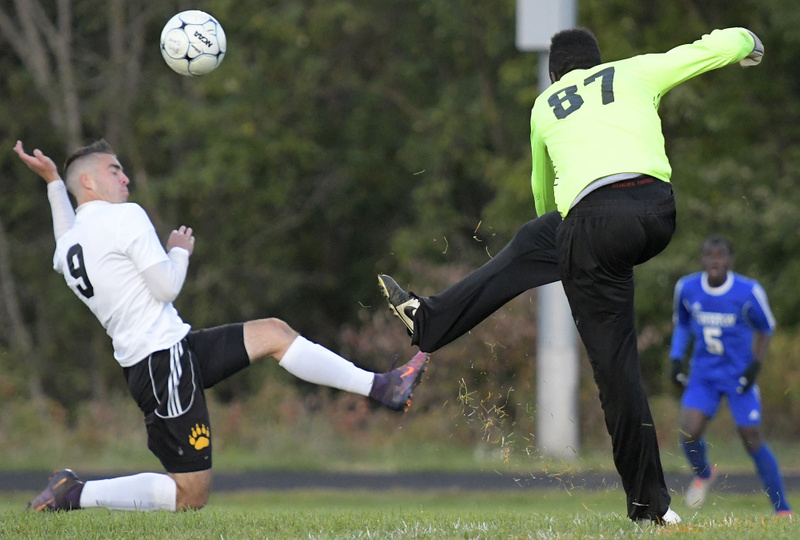 Maranacook forced a couple of Lewiston mistakes late, finally registering its only shots of the second half after falling behind by three goals. Senior Micah Charette stripped a Blue Devil back of the ball and turned to the goal in the 68th minute, but his bid hit the post. It was as close as the Black Bears would come to pulling a goal back for itself.